Big. Bold. Earthy. Tannins. Dry. These are the words I often hear and associate with Italian wines, and a good one (like an I-live-in-Italy Italian man who doesn’t live at home) is hard to find. And these words have often been quickly followed up by, “I’ll have a French wine, please. Or maybe a Pinot” in my experience. Many consumers don’t often like a side of WWF red wine with their dinner–you know, the kind that might beat you up with a developing palette bruise as you sip it? It’s true that in some circles Italian wines that you might want to drink within the decade they are bottled are hard to find. During the past month, I’ve tried about five different Italian reds, ranging from $24.99 to $49.99. I consider myself an expert-in-training, or at least an advanced novice, but I have to say–I was disappointed in my recent red italiano picks (My whites have been spectacular! More in a later post). As such, I hate to say it, but one of my favorite Italian reds and the topic of this post was given to me by a co-worker. The twist? It’s from Trader Joe’s. While not a two-buck chuck, I knew it was not going to be super spendy, as my co-worker somewhat giggled when describing it. The day before this bottle, I had thrown away a Chilean wine after first sip. I don’t do bad (those calories add up, and why should my face look like an overcooked baked potato when “enjoying” a glass after work?) As is common practice, I was alone (again) on a wintry Minnesota night (this description is way too kind this 2014), so I thought, why not? Let’s open the gift bottle now–my frozen pizza deserves some spruce. So, I waited a couple months for the right moment. This was it. The wine: Villa Cerrina Montepulciano D’Abruzzo 2012. Montepulciano is one of the most pla nted grapes in Italy, grown in regions such as Abruzzo (shocker, I know), Marche, Molise and Puglia. Because of overproduction in recent history, many have shied away from the wine because of a perceived dip in quality. 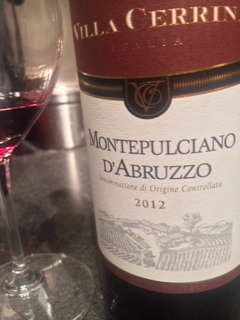 However, I would say like other Italian varietals that are undergoing careful planting, this wine is on the rebound. The nose was pleasant off the bat: fruity with some hints of spice and oak, it was fruit-forward more than the 13% alcohol in a 2012 Italian wine led me to believe. The first sip? Surprising! It was fresh, fruit-filled and accessible, with notes and flavors of red berries, blackberries a little more into the sip, and lightly dusted in oak, spice and earth notes (I would hazard a guess at vanilla, too). Medium in tannins and acid, I found this wine delightful on its own, and even fun and fruity with food. Two days later, I’m still drinking this wine, and find it as good on this day as the first. The kicker? If you look up the price, this wine comes in at a whopping $4.99. And yet, like it’s earlier cousin, there was no throwing away of this wine. I say, Bravo!, and please pick up a few bottles to have on hand for a wintry night, party night, loner night or a night that you want to share something enjoyable with a friend. Prego. E mille grazie, Pamela.